In the past few years, grill manufacturers have noticed that more and more people no longer have the luxury of a large yard. To address this growing need, most makers have introduced a small, 2-burner grill with fold down side tables so it will take up less space while still providing the owner with a full sized grill experience. Now, for 2013, Weber has redesigned the Spirit Gas Grills with a front control panel and fold down tables. 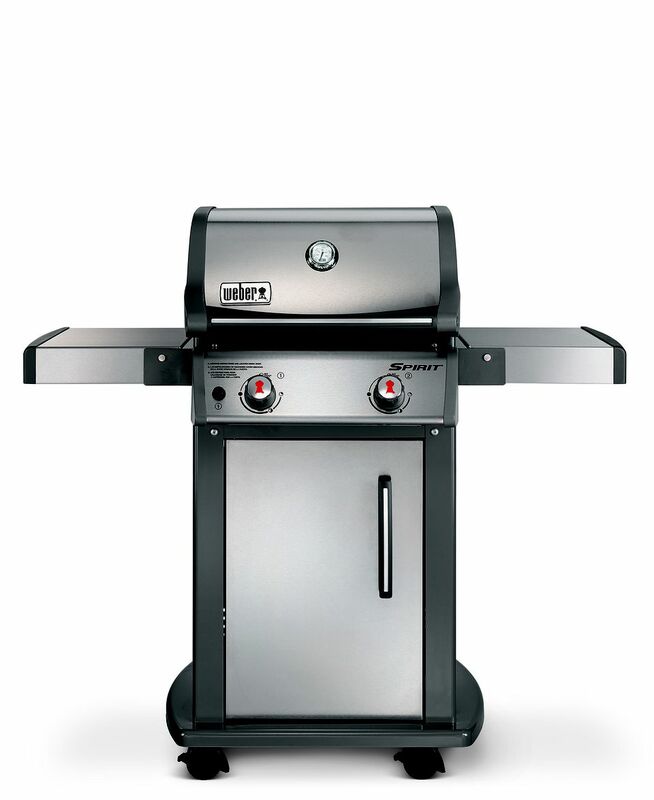 This is a no frills, 2-burner grill that gives a full grill experience for a small space. Newly redesigned for 2013, the Weber Spirit line has followed the popular Genesis line and turned its control valves to the front, clearing the right side table of knobs. This makes for a more standard grill but loses the one feature that truly made Weber Grills unique. The Spirit S-210 is small and comparatively inexpensive expensive. Designed with fold down tables, this "little" grill is perfect for small spaces like balconies, where gas grills are legal. Aside from the small footprint, this is a basic 2-burner gas grill. It offers very little in the way of bells and whistles other than the stainless steel body parts to make it look shiny. The 2 burners generate 26,500 BTUs of heat under 360 square inches of porcelain-coated cast iron cooking grates. This is not a powerful grill and the preheat times are long. However, the grates hold a lot of heat and allow for good heat transfer. This grill will do a good job of grilling a steak or burgers. The temperature range is wide so low-temperature cooking is very good. The 2-burner design gives enough space to indirectly cook a whole chicken or a roast, but the capacity is limited. Of course, anyone looking to buy a grill this size isn't looking for a large cooking area. The construction is good. Weber abandoned higher quality stainless steel in favor of price control, so this doesn't have the durability of Weber's of the past, but it is still a well-made grill. The door and hood of this grill are stainless steel as opposed to those on the Weber Spirit E-210. My recommendation is to buy that model and save the $50USD.